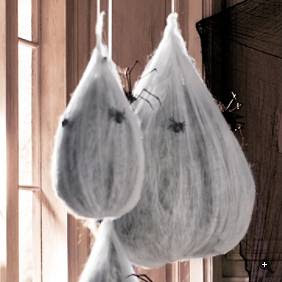 These larva balls will add even more detail to the web that we created last year (along with the "spun" person that had hung behind it). This will be easy to recreate. Newspaper for stuffing; some light weight cloth (like cheese cloth), and tons of spider webs will make this look realistic. Ahhh the scene that I want to set at the front room in my house. I'd kill for the painting; however, I can't imagine spending $100 on it. This whole scene probably cost around $1,000 on Grandin Road. 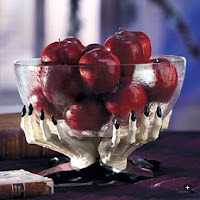 I already have scary cats, and am hoping to score another candelabra from goodwill. I'm hoping to make one sitting mummy if not two, and using the same technique as we did for the spun person (newspaper, maybe a little paper mache action, and cloth from home depot should do the trick). I also want Jon to build a mini coffin like the one pictured on the ground. With some recycled wood this coffin project should come to under $20. 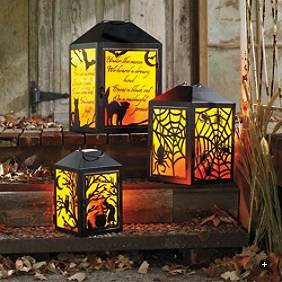 LOVE these lanterns; however, the smallest one starts at $49 and the largest in upwards of $80! If I can find some lanterns at the thrift store I can cut out various halloween shapes from one of the three Halloween Cricut Cartridges I have, modge podge them on, and add a velum paper behind the scene. To make these a bit safer if I used battery operated candles OR actual light bulbs I won't have to worry about candles that could potentially start a fire. 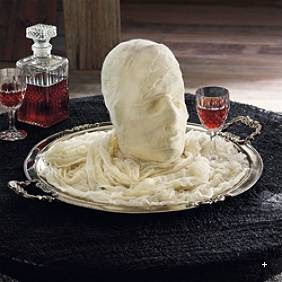 I LOVE this mummy head on a platter. 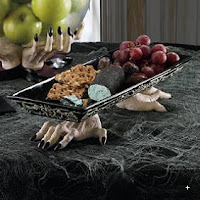 All I need to find is a platter at the thrift store, and the rest will be history! Love both of these platters! I'm really hoping I can recreate these. I have some ideas brewing on how to construct them... we shall see if they work! As we complete these projects I'll be sharing them with my readers, and hopefully providing a few tutorials along the way. Plus other projects we decide to work on for Halloween as they become finished. These are our major projects for the month that we want to try to accomplish! Fingers crossed they all get completed and turn out great! 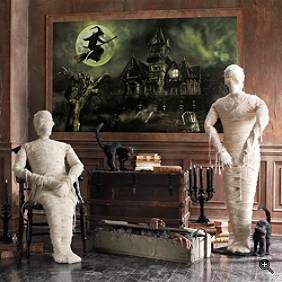 The Martha Stewart Halloween mag for this year has a bunch of projects from Grandin Road and so does her website if you check it out. The Spider egg sacs are there for sure in the magazine. I love cooking and crafting!